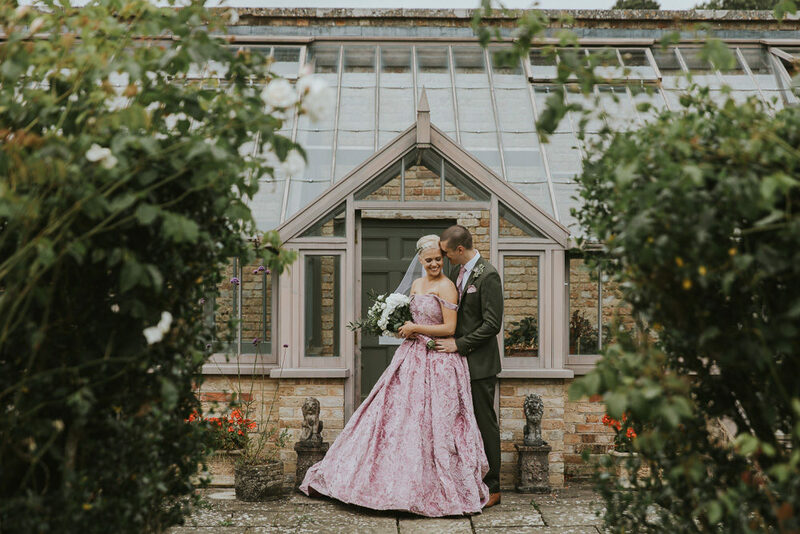 There really is nothing I love more than a bride in pink and Hannah looks utterly ravishing in her bespoke gown, made from the most fabulous blush pink silk with a velvet brocade pattern. Paired with Josh’s forest green suit, they look super stylish and modern, a new take on classic bridal. 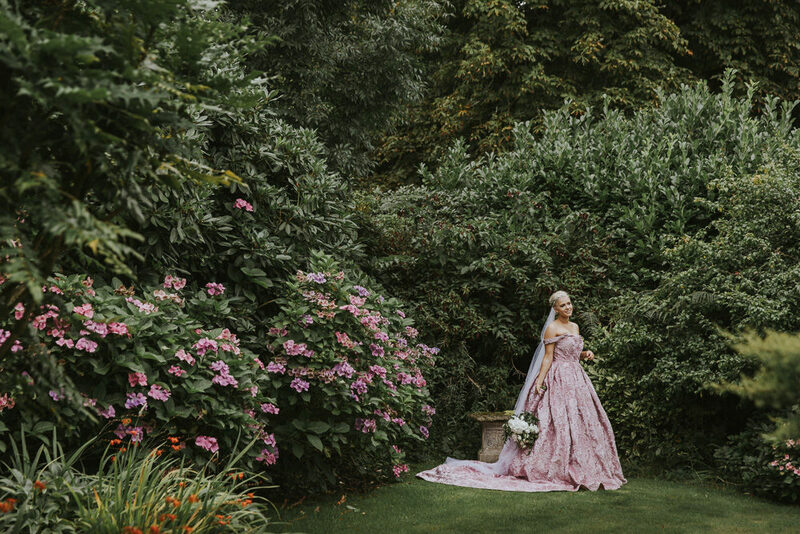 Hannah’s dress has all the drama of a bridal gown, but that soft, romantic colour is so striking. 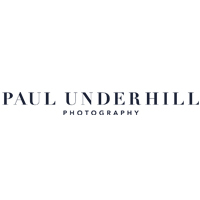 Images come from Dorset Photographer Paul Underhill, whose natural, reportage style always looks beautiful here on RMW. 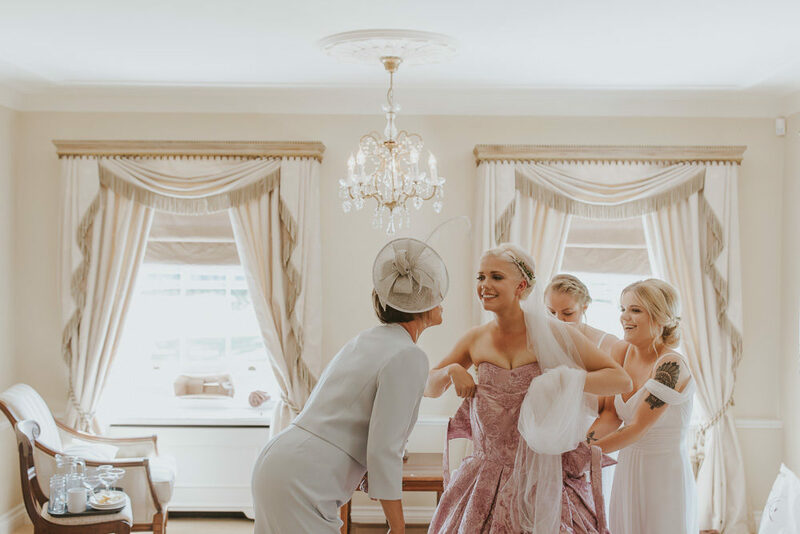 Hannah the Bride: We both grew up in Purbeck, Dorest but only met when we finished our GCSEs in 2008, a large group of our friends went to Plymouth University & we both ended up studying there so just carried on going out. Through our ups & downs we’ve stayed together & Josh proposed Boxing Day 2015 at his family Christmas party. Though we’ve settled in Plymouth after finishing university, we knew we wanted to get married closer to home, where all our families live. We knew we wanted a summer wedding as that was when we started going out. 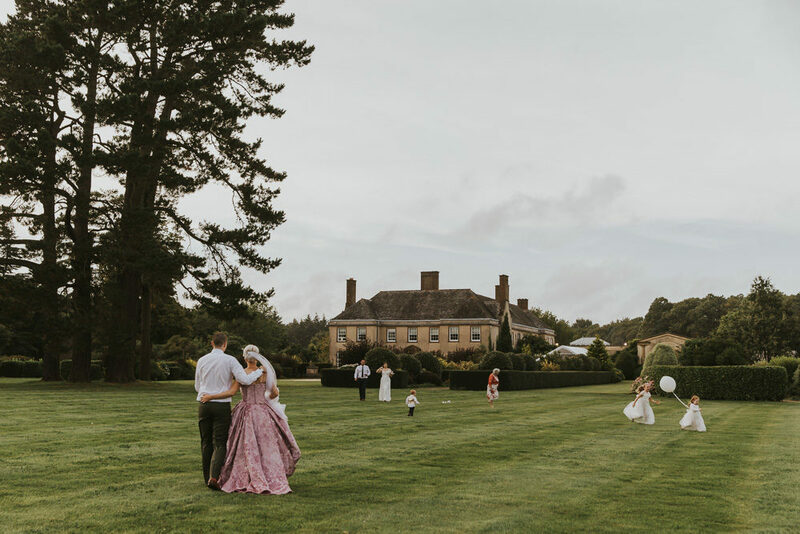 We were hoping to hold the wedding at my grandparents’ house as they have a beautiful garden in the New Forest, it probably my favourite place in the world. 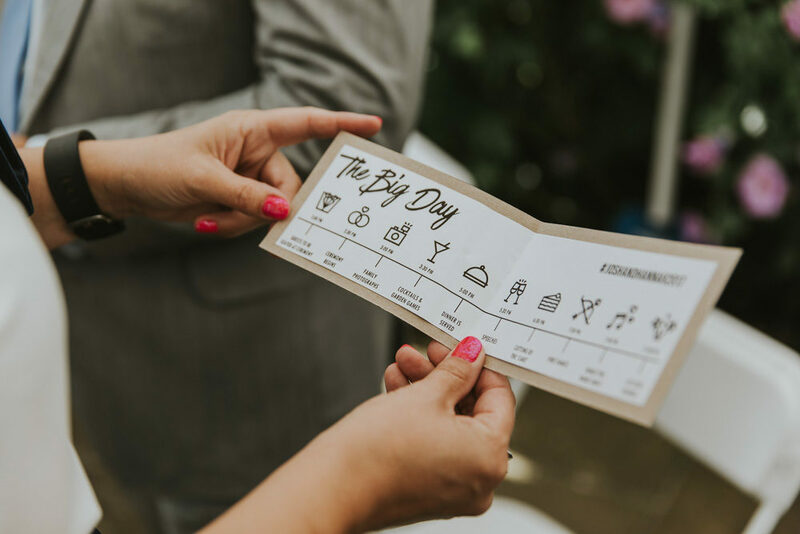 but unfortunately, we realised the costs & upheaval it would have caused, bringing everything from marquee, generators, caterers, to all of the guest’s cars so we went on the hunt for something closer to our hometowns. Josh’s stepdad is a builder & helped to build Monkey World, a monkey rescue sanctuary between Wareham & Wool. 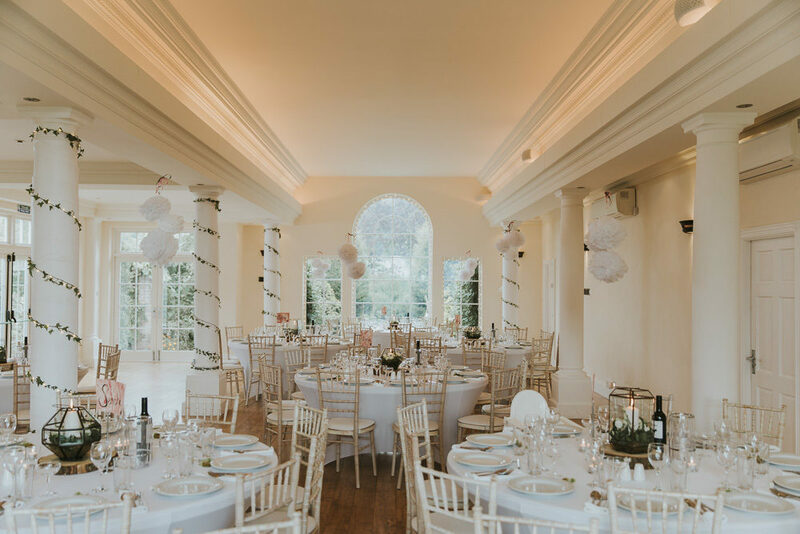 The charity had recently acquired a manor house & land that backed on to Monkey World & were using it as a function & events venue. Not that many people know that it’s there, hidden behind a dirt track & trees, there is spectacular house with a water fountain on the drive, a rose garden, maze & long perfectly trimmed garden lawns. I don’t think we went to look at any other places after seeing Hethfelton House, I knew exactly where everything was going to go. 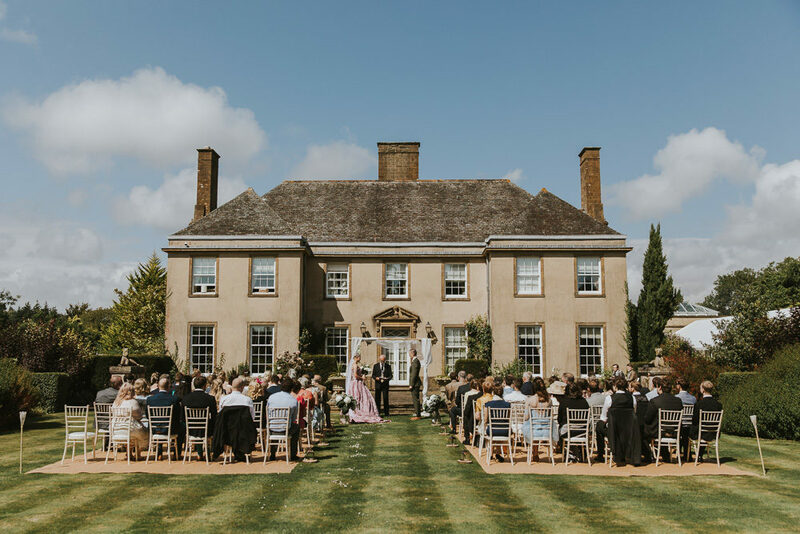 My English country garden wedding would happen! 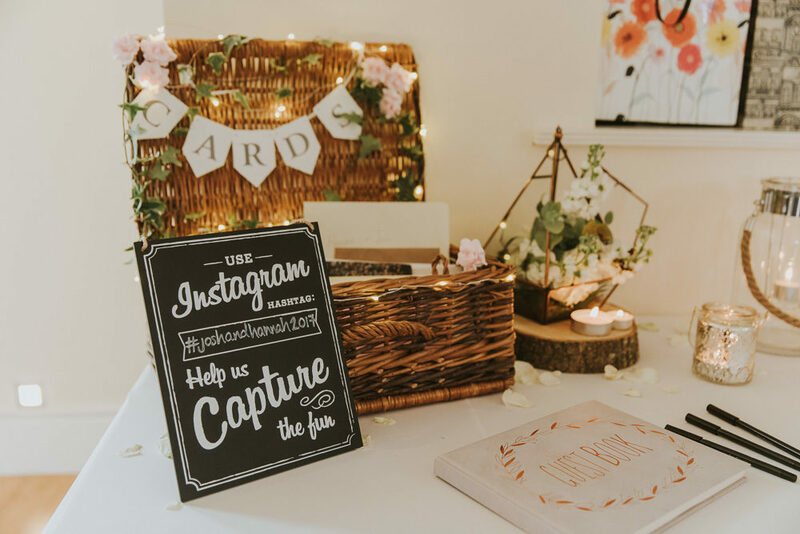 I studied events management at university so have researched a lot on weddings. We both decided that whilst the location might be classical, we didn’t want to conform with everyone’s expectations. We’re both foodies & after location, catering was going to be a big cost. We didn’t want a boring sit down three course meal where not everyone likes it & half the food is wasted. We wanted a funky buffet bursting with flavour & variety picking our some of our favourite foods. My parents have some friends who run a local organic farm so one of our gifts was a lamb spit roast to accompany the buffet. We managed to find local caterers Crab Apple who supplied a fantastic spread of Mediterranean frittata, homemade breads, chicken wings and an amazing selection of salads. Everyone filled their plates & some even went up for seconds. Everyone seemed so excited about what they were eating, we were definitely pleased with picking Crab Apple. Just like the food, we wanted our outfits to be a bit different. When we first got engaged Josh liked the idea of a navy blue suit, but by summer 2016 they were everywhere in the shops so he wanted to find something different again. Fitting in with the garden, natural theme, he went to a tailor who found a wonderful forest green material that made a very dapper suit. My dress was a bit of a harder challenge. I’m more of an androgynous dresser for every day. I like trousers, skinny jeans & shirts, and am quite tall, so I wasn’t sure what sort of dress would best suit me. I went to a number of different shops & I tried on about 30 different styles, colours, shapes but nothing was right. I found a local dressmaker who made unusual wedding dresses. I came with a selection of ideas, this part from this dress, that bit from here but in that colour. 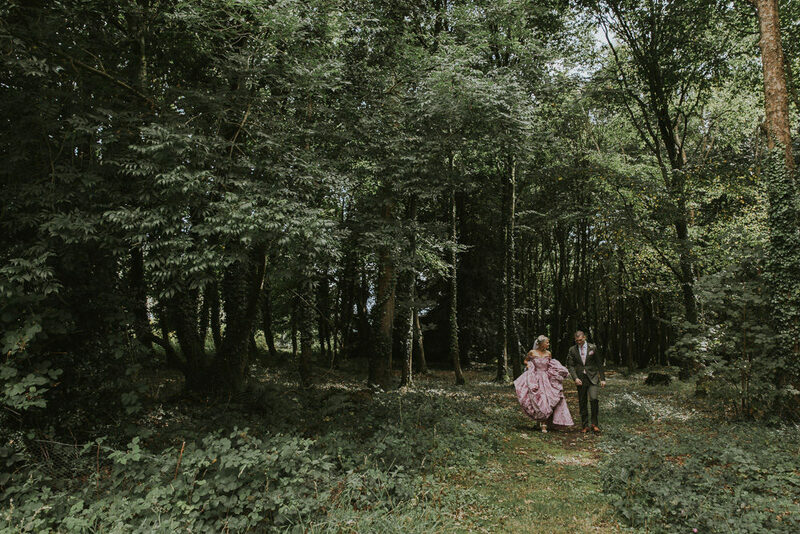 She designed the perfect fairy princess dress that wasn’t too fru fru but in a phenomenal fabric from Bennet Silk – a blush pink silk with velvet brocade that made the whole dress unique. 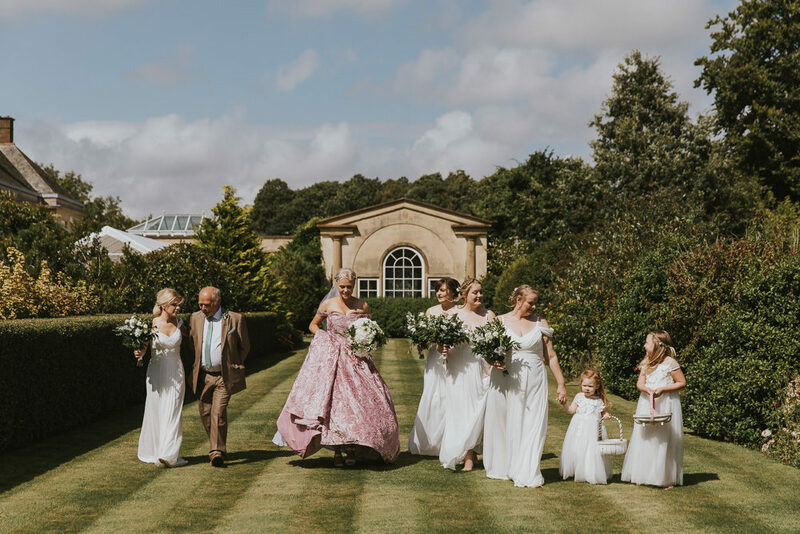 Since my dress was big & pink, we went completely the other end & picked white Grecian style dresses for the bridesmaid which brought all our colour theme together of green, pink & white. For our flowers & décor we mixed indoors & out, for our ceremony, we chose out on the front lawn with classic chairs & some of our larger decoration vases stood on wooden trunk blocks. Josh’s mother & stepfather made us an arch to stand over for our ceremony that they decorated in white organza & white flowers. We picked a white & green for our flowers, with hydrangeas, lisianthus, dahlias, spray roses with myrtle, ruscus, eucalyptus, ruscus, bay leaves & other assorted greenery found in the venues gardens. We went for simple colours as we had a lot of them. I am a Christian so wanted a religious ceremony but as we weren’t getting married in my church in Plymouth, we opted to have an outdoors ceremony with a close friend from my church officiating the ceremony. We did the legal signing in the morning of the wedding as the venue was licenced, so it was a lot easier to do outside. Despite the rain the night before & the day after the wedding, we had fantastic weather, not too hot or too cold which meant our plans to have much of the wedding outdoors were possible. After garden games in the back lawn with Pimms whilst we had our group photos (from fantastic photographer Paul Underhill), we all went into the house for dinner, speeches & pudding. Rather than having dessert & a cake, we just picked to have croquembouche as our wedding cake & served it as a dessert. We ended in the evening with a brilliant band Nu Generation as everyone danced or sat by the fire pit in the garden. 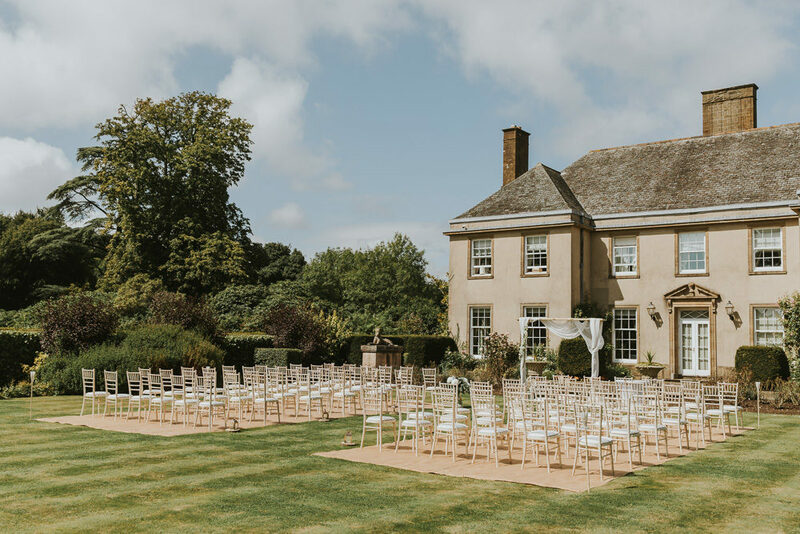 Josh & I stayed at The Priory Hotel in Wareham that night which fitted in with English country garden theme & is my favourite place in Purbeck so was the perfect end to our special day!